Looks like upcoming Han Solo spinoff flick really will be "solo," if you catch our drift. Not only is the film a standalone based on sheer premise alone, but Rogue One director Gareth Edwards confirmed that it would be unlike the previous side-shoot installments of the Star Wars film canon. Lucasfilm has been cranking out movie after movie in the ever-expanding Star Wars universe (not that we're complaining… at all), with the most recent foray coming in the form of the solo film Rogue One: A Star Wars Story helmed by Gareth Edwards. The company recently kicked off filming on the yet-untitled Han Solo standalone movie, and Edwards spoke up about the project and how it relates to his. In a brief interview at the Empire Film Awards Sunday (March 19), Edwards explained that the Phil Lord and Christopher Miller-directed film won't be at all similar to Rogue One. "[Lord and Miller] are amazing filmmakers. I'm very excited about what they do," Edwards said. "It'll be a completely different film to what we did. I think they've got the hardest task, I think, out of all the films that I heard about that one is probably the greatest challenge and they're gonna knock it out of the park." Gareth was candid in saying that he wouldn't have the guts to pull off what Lord and Miller are in the Han Solo standalone film, but expressed full confidence in the director duo, even teasing that he's seen bits and pieces of what they're working on. "They've got really good taste. You glimpse things—you try not to—as you're going about your business, but you see stuff," he confessed. "And everything I saw, I got really jealous about it." The unnamed Han Solo Star Wars anthology has a tentative release date of May 25, 2018. 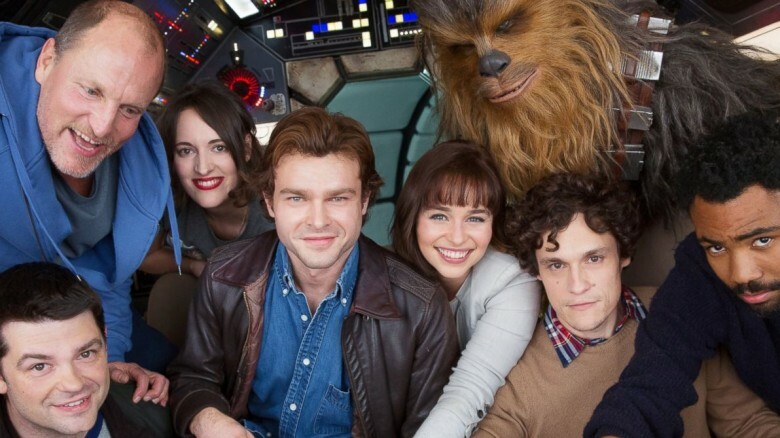 It stars Alden Ehrenreich as young Han Solo; Joonas Suotamo as pre-A New Hope Chewbacca; Donald Glover as Lando Calrissian; and Woody Harrelson, Phoebe Waller-Bridge, Thandie Newton, and Emilia Clarke in yet-unidentified supporting roles. Since we realize the wait for more details can be agonizing, we've got you covered with what you should expect in the Han Solo standalone film.